This produces an icing with the trademark glossy sheen of a good royal icing. It’s easy to make, since you likely have 3 eggs sitting in your fridge. The concern here is using raw egg whites, which can be a health concern for some. You can solve this by buying pasteurized eggs (they exist!) or using meringue powder. Make the icing: Combine 1 lb. (3 ¾ cups) confectioner’s sugar with 3 large egg whites in the bowl of an electric mixer fitted with the whisk attachment (or use a handheld mixer). Whisk on medium-high until peaks form. Thin as needed with 1 teaspoons of water at a time until the icing looks glossy and bright white. Meringue powder is made from powdered egg whites and is my favorite pick to make royal icing. You’ll still get the volume and body of an egg white-based royal icing, but without health concerns of raw eggs. Plus, meringue powder is inexpensive and can keep in your pantry for years. This is a great option for health safety and that classic look, but requires getting an extra ingredient from the store. Make the icing: Combine ½ cup meringue powder with ½ cup water in the bowl of an electric mixer fitted with the whisk attachment (or use a handheld mixer). Whisk on medium-high until peaks form. Add 1 lb. (3 ¾ cups) confectioner’s sugar and beat until well combined. The mixture should look glossy and bright white. Thin as needed with 1 teaspoon of water at a time. Technically, a royal icing has to contain eggs, so this super simple version is just an icing. It doesn’t have the brilliant white shine of the egg-based royal but it is so easy. I recommend this version if decorating with kids or if you want to quickly decorate a batch. This recipe is good for anyone with egg-allergies or who doesn’t want to buy a special ingredient or use raw eggs. Make the icing: Combine 1 lb. (3 ¾ cups) confectioner’s sugar and ¼ cup milk in the bowl of an electric mixer fitted with the whisk attachment (or use a handheld mixer). Whisk on medium-high until the mixture is completely smooth with no lumps remaining. Add 1-2 tablespoons milk, until the mixture is easily pourable but not too runny. I use small squeeze bottles to decorate my cookies. They are reusable, easy to refill, and easy to handle. Pastry bags, particularly plastic ones, are fine to use, but I find they create extra mess. I particularly like accordion-style squeeze bottles like these from Kuhn Rikon. If you do use a squeeze bottle, I recommend keeping it inverted it in a sturdy glass or mug between piping, so the frosting is easy to squeeze out. For intricate designs and accurate placement, an inexpensive pair of surgical tweezers are indispensable. Amazon stocks inexpensive ones. After piping icing into your desired shape, an offset spatula allows you to smooth the icing to evenly fill the shape. I also use a clean offset spatula to gently press and jimmies into the icing to firm up an edge. What can’t this kitchen workhorse do? 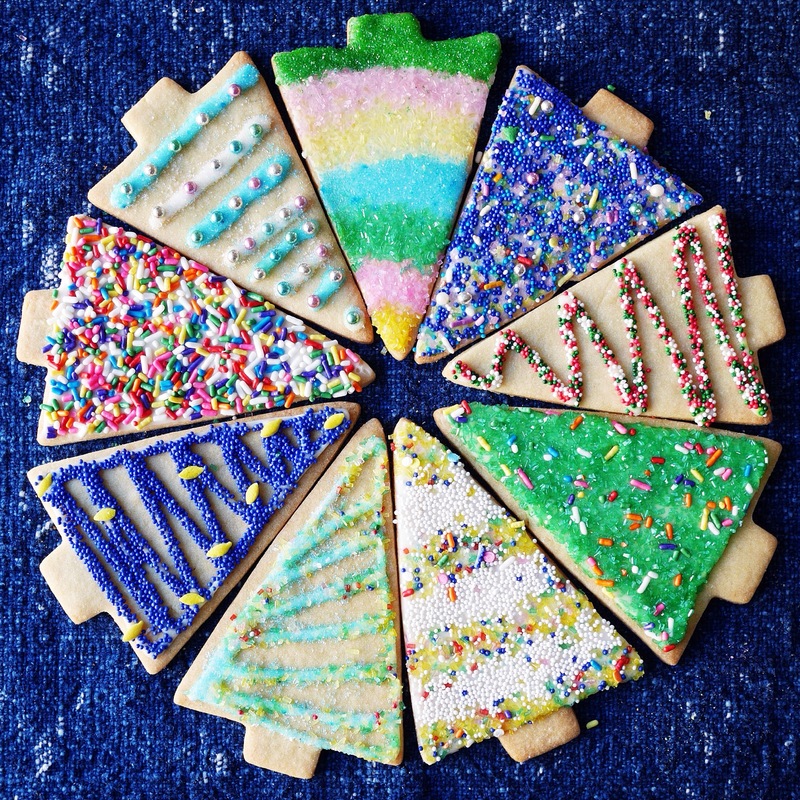 A box of toothpicks is inexpensive and will see you through testing cakes, hors d’oeuvres, and now, cookie decorating. Use to smooth icing, as with the offset, above, to fill up a design or smooth an edge. Decorating on top of a paper plate allows you to save the sprinkles that don’t attach to the icing. After the sprinkles have covered the icing, move the cookie aside, fold the plate into a funnel-like shape and pour the remaining sprinkles back into the original jar. Repeat with fresh icing and sprinkles. It’s a constant battle between my creative artist side and my inner neat freak when it comes to decorating cookies. I love the explosion of colors and shapes and it can be fun to let loose and see what fun designs you can create. However, nonpareils have a sneaky way of rolling amok. Decorating with all your tools inside a rimmed baking sheet keeps the mess at bay. Lindsay, I’m so sad I didn’t’ see this before the holidays, or I would have pinned and posted the heck out of it. Such a great post–beautiful images and all around fun! Love that zig zag green tree.